it's no news that I struggle with time management or anything else that need management. For my current mom entrepreneur job title, it's no Bueno! I recently took a personality test to see if there were any residual Type-A genes I could harness but what I find out is that I'm a type "HIJKLMNOPXYZA"! I don't recall the exact set of letters, but it looks like something mention above. The test results said that this personality trait was so complex and rare only 2% of the population was part of that group. Big womp! I didn't need a test to tell me I'm weird, I knew that already. What I needed is how I can harness some of those Type-A genes! Type-A folks can be annoying, but they get stuff done, their OCD tendencies can be a blessing. One of my girls may have inherited some of those traits from my dad, she can be a blessing to me... Sometimes. I can't wait for her to get older so I can turn the house over to her. Of course, she's going to kick her sister and I out. Since we don't share her idea of color coded shoes rack. While we can't all live with color coded shoe rack and neat to-do lists. There are some type-A behaviors that are really handy and worth harnessing by any mean. Number one issue for the Non-Type-A person is being on time. How to remedy that? Simple! If you are scheduled to be somewhere at for 10:30 tell yourself it's at 10. Put it in your calendar for 10:00, tell everyone you have to be there at 10. After repeating enough time, your brain will register the appointment for 10:00. Now even if you try to be late you'll have a 30 minutes cushion to keep you right on time. The Non-Type-A person HATES to-do lists! How to remedy that? Again trickery is your best friend. Add finish items to to-do list so you can cross them out. In doing so, you will give yourself a great sense of satisfaction that will boost your energy and moral to accomplish more. When you have more stuff crossed out on your to-do list, you can add more to it without feeling intimidated by tasks. Add fun to your schedule. Just schedule your lazy time and be done with it. Make time for your Netflix binge so it won't interfere with more pressing matters or make your calendar look depressing. Take a day off for rainbows and unicorns, get it out of your systems. Give yourself a deadline and stick to it. Schedule a 30 minutes block of play time right after to give yourself something "fun" to look forward to. 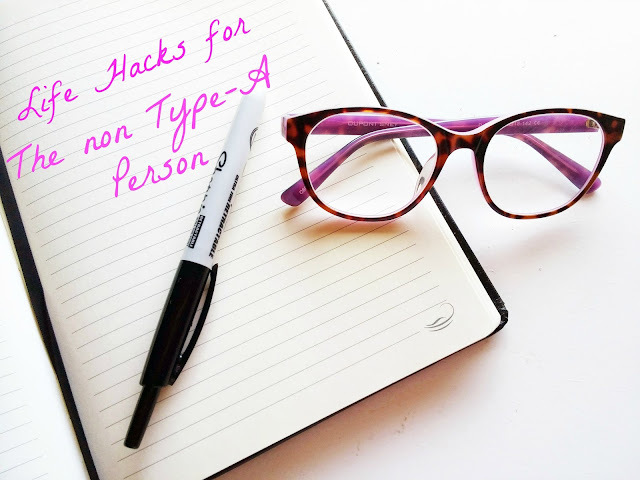 Are you part of team Non-Type-A? can you relate? I loooove this! I grew up with a Type A mom and it wasn't until after college that I admitted to myself (even though everyone who knew me already knew) that I just couldn't operate that way. Now I'm being more honest with myself about the precautions I need to take to get stuff done on the same level and at the same quality as a Type A. One or two of these I read & was like 'I do that! Thank god that's valid' lol and others are really great tips that I'm interested in trying. Thanks!